Jan van Eyck (before 1390–1441) and workshop, Virgin and Child, with Saints and Donor (detail) (c 1441-43), oil on panel, 47 × 61 cm, The Frick Collection, New York, NY. Wikimedia Commons. Most real landscapes contain real figures. Just as the Renaissance brought the realism of surface textures and optical effects to paintings, so it brought real figures to its realistic landscapes. Not that anyone could paint a pure landscape in the fifteenth century, of course – they still had to be background views seen behind a figurative foreground, usually depicting a solemn religious scene. But there among the soaring rocky peaks, dense woods, green pastures, and post-mediaeval towns, are people. These figures are characteristic of the miniature background landscapes which became popular in paintings of the northern Renaissance, the first great masterpieces painted using oil paints. Like their elaborate textured and patterned fabrics and precise reflections, the figures are minute details in small views within relatively small paintings. Every man, woman, horse, and cart is a tiny jewel. Jan van Eyck (before 1390–1441), The Madonna of Chancellor Rolin (c 1435), oil on panel, 66 x 62 cm. Musée du Louvre, Paris (WikiArt). One of the earliest and best-known examples is in Jan van Eyck’s The Madonna of Chancellor Rolin (c 1435). 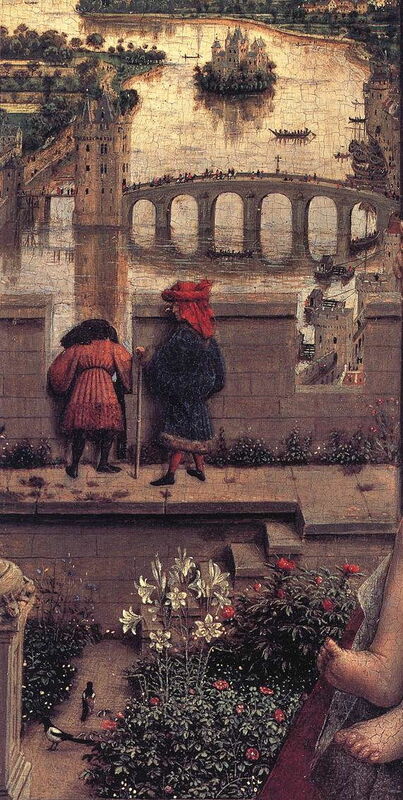 Look behind the figures, beyond the open arches, in the detail below, and two small figures stand at the castellated wall, their backs towards the viewer. Go even deeper into the painting and there are crowds crossing the bridge, and two small boats are packed to the gunwhales. Jan van Eyck (before 1390–1441), The Madonna of Chancellor Rolin (detail) (c 1435), oil on panel, 66 x 62 cm. Musée du Louvre, Paris (WikiArt). 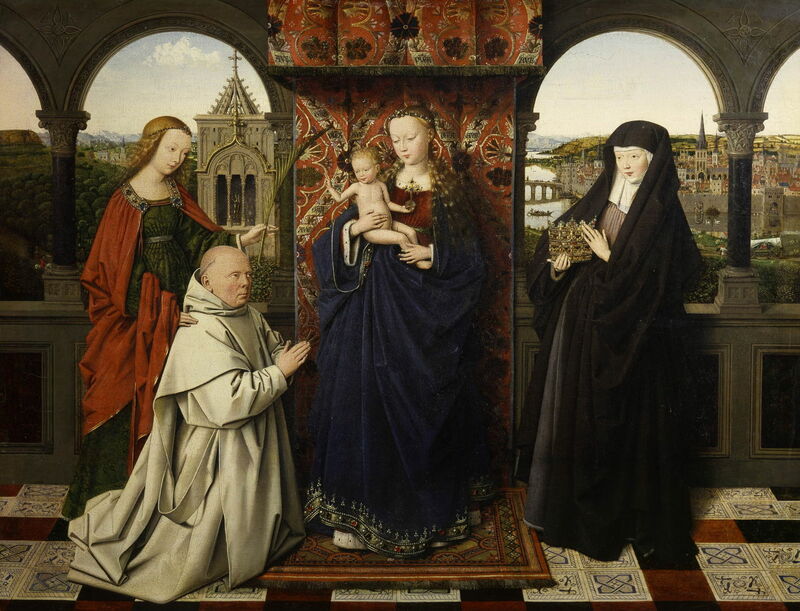 Jan van Eyck (before 1390–1441) and workshop, Virgin and Child, with Saints and Donor (c 1441-43), oil on panel, 47 × 61 cm, The Frick Collection, New York, NY. Wikimedia Commons. 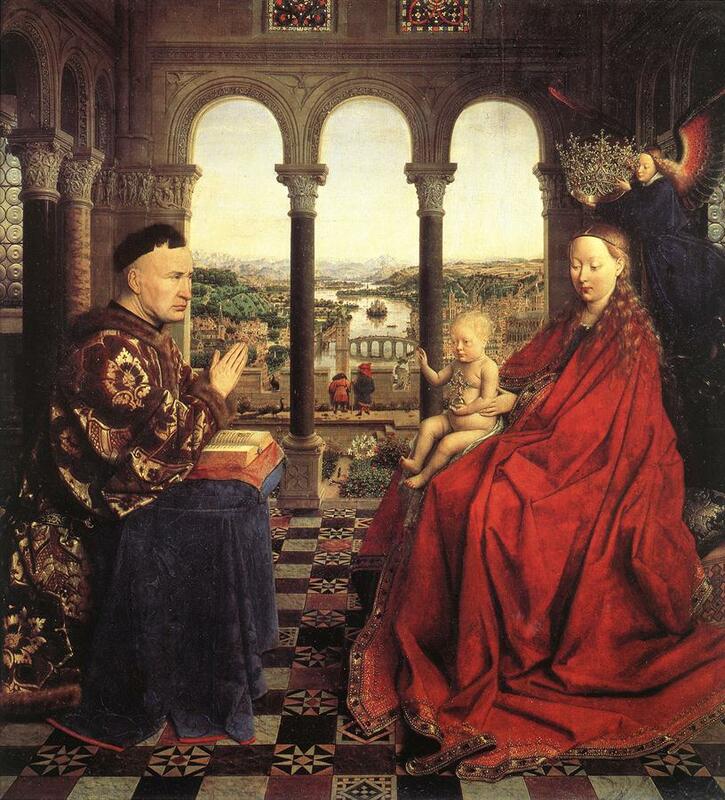 Van Eyck and his workshop did very similar details in the Virgin and Child, with Saints and Donor (c 1441-43). 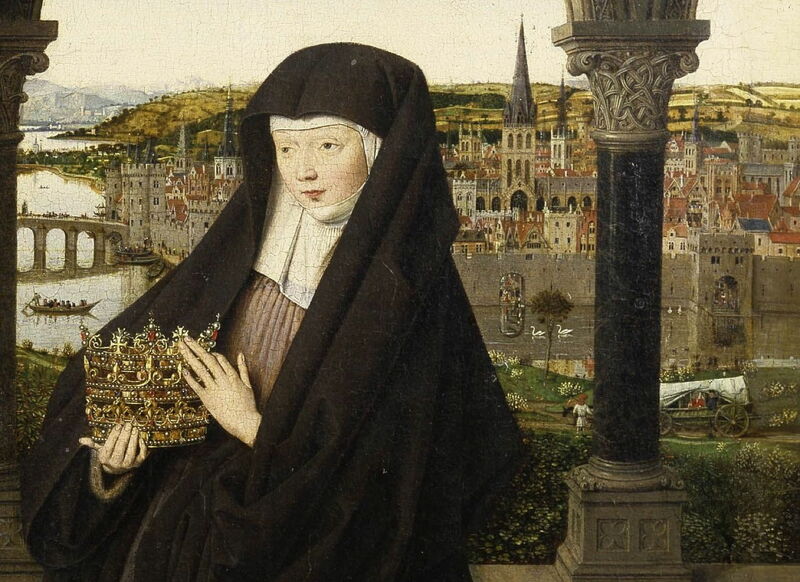 Behind the figure of Saint Elisabeth of Hungary at the right is another very similar town scene (detail below), with crowds crossing a bridge and in a boat on the river. Further to the right a substantial cart is being led along a road on the proximate riverbank, and a pair of swans float serenely on the mirror-like surface of the water. Rogier van der Weyden (1399/1400-1464), Saint Ivo (Portrait of a Man Reading) (1450), oil on panel, 45 x 35 cm, The National Gallery, London. WikiArt. 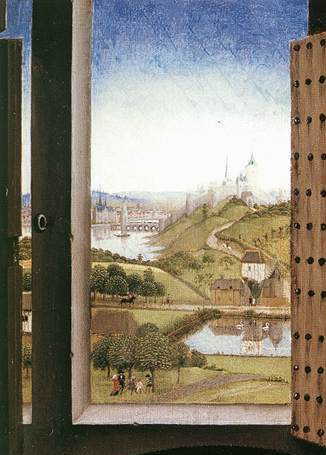 Rogier van der Weyden’s plainer if not austere Saint Ivo or Portrait of a Man Reading (1450) flowers into delightful detail (below) in its miniature landscape, shown through the open window. In addition to a small and colourful group of figures under the trees, there is traffic along the road on the other side of the lake, and another pair of swans on its water. 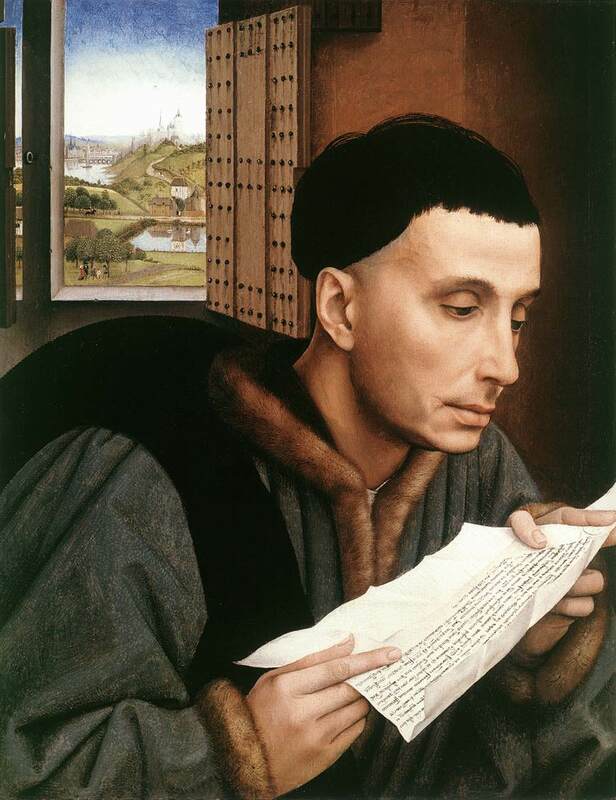 Rogier van der Weyden (1399/1400-1464), Saint Ivo (Portrait of a Man Reading) (detail) (1450), oil on panel, 45 x 35 cm, The National Gallery, London. WikiArt. 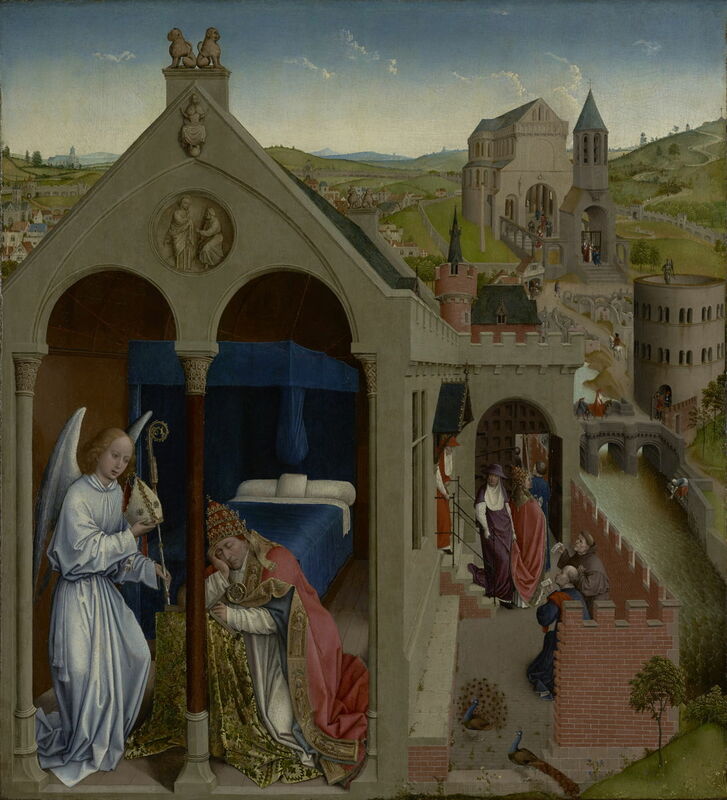 Rogier van der Weyden (workshop) (1399/1400-1464), The Dream of Pope Sergius (c 1437), oil on panel, 90.2 × 81.3 cm, The J. Paul Getty Museum, Los Angeles, CA. Courtesy of The J. Paul Getty Museum. Most of these figures appear to be straightforward staffage, but that cannot be assumed. In Rogier van der Weyden’s workshop painting of The Dream of Pope Sergius (c 1437) the figures are part of a complex multiplex narrative (detail below). Sergius dreamed that an angel told him that Bishop Saint Lambert had been killed. The smaller figures here tell the story of the Pope’s subsequent actions: nearest the viewer, the Pope and two of his cardinals meet a noble and a friar as they leave the building. A cardinal is seen crossing the bridge, near which a woman is doing her washing in the river. In the distance, the Pope presents a bishop’s mitre and staff to Saint Hubert, successor to Saint Lambert, on the steps of Saint Peter’s Cathedral. Beyond that, other figures travel out of Rome along a road. Rogier van der Weyden (workshop) (1399/1400-1464), The Dream of Pope Sergius (detail) (c 1437), oil on panel, 90.2 × 81.3 cm, The J. Paul Getty Museum, Los Angeles, CA. Courtesy of The J. Paul Getty Museum. 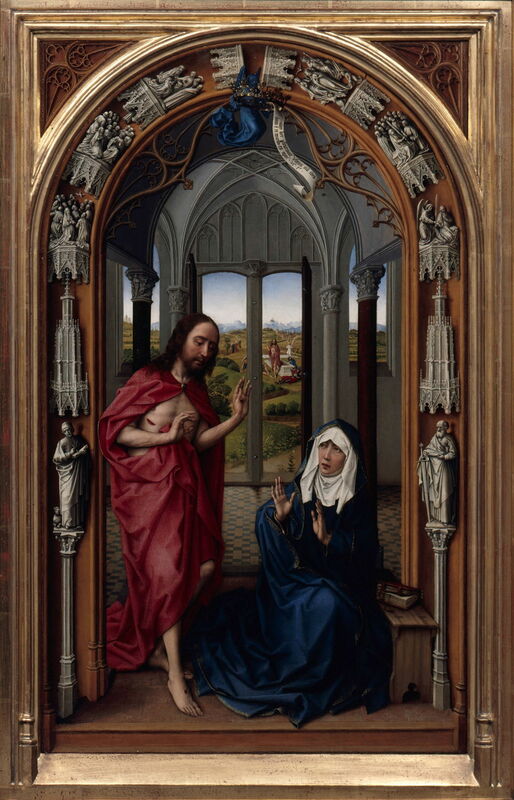 Rogier van der Weyden (1399/1400–1464), The Altar of Our Lady (Miraflores Altar, right panel) (c 1440), oil on oak wood, 213 x 43 cm, Gemäldegalerie der Staatlichen Museen zu Berlin, Berlin, Germany. Wikimedia Commons. 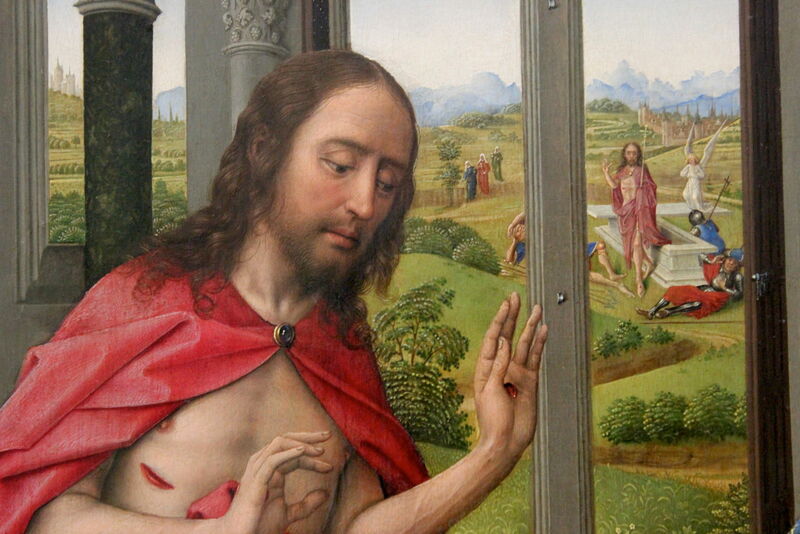 In the right panel of Rogier van der Weyden’s Miraflores Altar (c 1440), the risen Christ, still bearing his stigmata, is accompanied by a background scene (detail below) showing the resurrection, with three sleepy soldiers, Christ standing beside his empty tomb, and a winged angel. In the distance are the three Marys. Rogier van der Weyden (1399/1400–1464), The Altar of Our Lady (Miraflores Altar, right panel) (detail) (c 1440), oil on oak wood, 213 x 43 cm, Gemäldegalerie der Staatlichen Museen zu Berlin, Berlin, Germany. Image by Miguel Hermoso Cuesta, via Wikimedia Commons. Antonello da Messina (c 1430-1479), Saint Jerome in his Study (c 1475), oil on lime, 45.7 x 36.2 cm, The National Gallery, London. Wikimedia Commons. 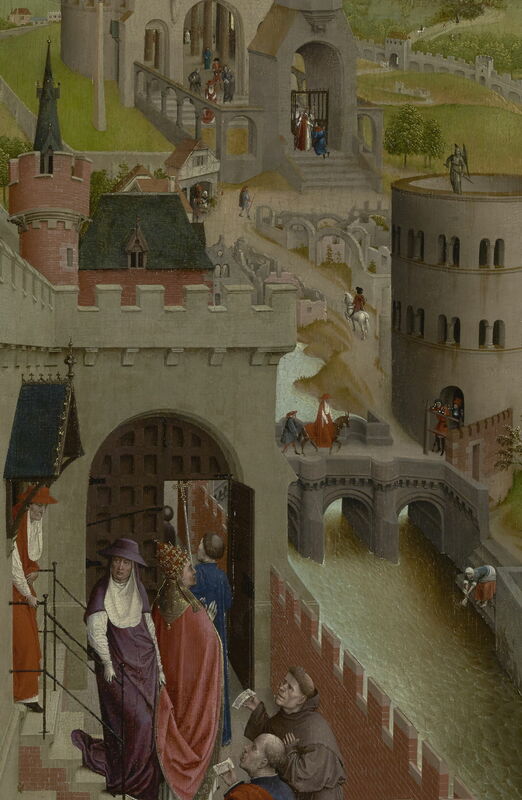 These figures in their miniature landscapes are a marker of the influence of the northern Renaissance when its oil paints and techniques moved to Italy. 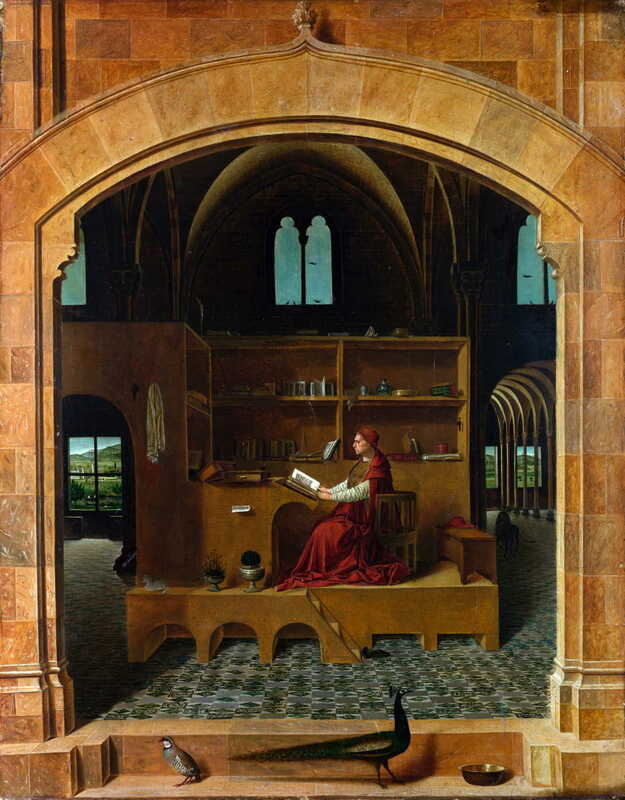 After Antonello da Messina had learned northern techniques, he too painted tiny figures in his Saint Jerome in his Study (c 1475). As shown in the detail below, the small windows at each side of the saint reveal landscapes. Two figures are rowing a boat across a pond, others watch from its banks, and deeper into the view there are two people on horseback and a flock of sheep. Antonello da Messina (c 1430-1479), Saint Jerome in his Study (detail) (c 1475), oil on lime, 45.7 x 36.2 cm, The National Gallery, London. Wikimedia Commons. These landscape miniatures are arguably the beginning of modern Western landscape painting, and it is significant that even at this stage and relatively small scale, they often merit staffage. This practice was by no means universal: in several works from the northern Renaissance, figures are omitted completely from their embedded landscapes, giving them an eery and desolate appearance. It looks likely that among their other achievements, the van Eycks, Rogier van der Weyden, and Robert Campin also discovered how effective staffage can be in landscape painting, almost six hundred years ago. Posted in General, Painting and tagged Antonello, da Messina, figures, landscape, narrative, painting, staffage, van der Weyden, van Eyck. Bookmark the permalink.